Today is about differentiating our Ubuntu and GNOME vanilla session to provide different defaults per session. A lot of other noticeable changes that we do in ubuntu (welcoming window disabled in GNOME software, File chooser dialog always opening in current directory instead of recommended, default set of plugins in some softwares like rhythmbox, power settings) are reset to their default in that particular session. Remember that this session isn’t installed by default but is available via a simple apt install gnome-session. It has never been easier in Ubuntu to taste something really close to upstream vision! Not that many visible changes: we still have icons visible on the desktop in that session. However, the trash (or bin, take the flavor you prefer ;)) icon is available back on the desktop as our dock won’t include. The more observers will notice that there are 3 window buttons (minimize, maximize and close, which makes more sense having this incoming dock in that session), on the right, as we announced some days ago! How did we implement that? All of this magic relies on a very recent glib feature reported here. This one isn’t available yet upstream, but we got the blessing by Allison (upstream glib developer) to take it as is for now. We this uploaded it as a distro-patch. However, this change going to be merged soon in glib master, once more regression tests are written. Alberts implemented a per session gsettings override, which enables having different default per desktop name. Allison cleaned it up a little bit while we were discussing about it at GUADEC and Alberts fixed some remaining bugs! Thanks to both of them for helping us proactively delivering this! What remained to be done was to add new desktop names: our default ubuntu session has XDG_CURRENT_DESKTOP=ubuntu:GNOME while the vanilla GNOME one has just XDG_CURRENT_DESKTOP=GNOME. Then, reorganizing the exiting override (after a lot of cleanup, removing redundancies across packages) to separate between “global distribution-wide overrides” that we want globally available and per-desktop ones was easy. The idea is really to only impact our sessions when we want to have different behavior than the default upstream one, without impacting the other session. So, what about Unity you will say? Remember that people upgrading will still have the “unity” session available (it won’t be the default session and people will be transitionned to our newdefault ubuntu one using GNOME Shell), and people installing from scratch can still apt install unity if they want to have this unity session available in their display manager. We had similarly warned the Ubuntu MATE team, as those changes was impacting them too, so that they can prepare for it. Of course, all this is only overriding defaults. It means that if you change one of those settings (like chosen theme or settings in an application), this is an user change. As an user change is more important than defaults, it will impact all sessions. Indeed, it would feel weird to have some keys impacting only some sessions, and other like your social accounts, where you definitively want them to be system-wide. The more robust and understandable behavior is thus to say that any user action changing a setting will be available whatever desktop the user is on. We think that this schema is an improvement over the current override system in GNOME Shell. Indeed, this one is only available on a few hardcoded GNOME shell modes, and so, we would have needed to distro-patch to add our own “mode”. Furthermore, it can only impact some defined mutter keys, like button position, modal dialog behavior… Consequentely, it can be easily go out of sync with current mutter schema if this one changes. 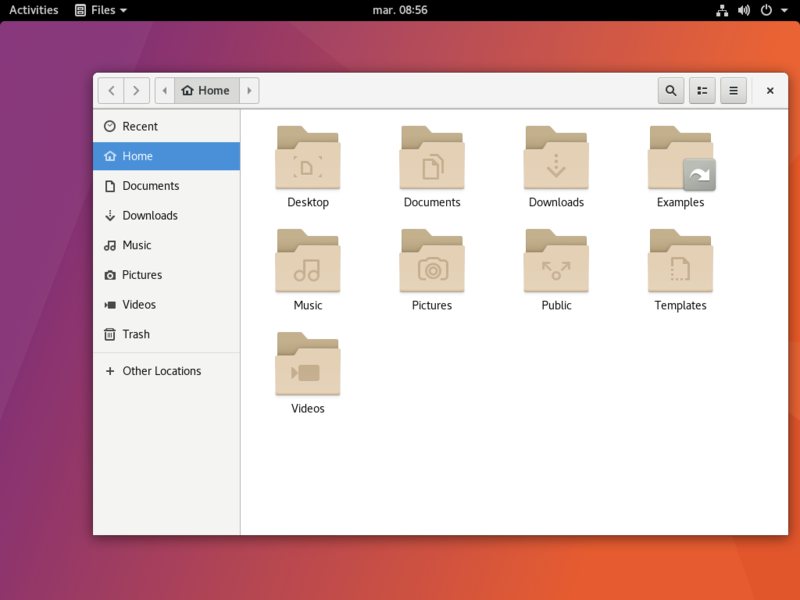 One of the keys that can’t be overriden is, for instance, the default GTK theme. That’s why I’m proposing having a look at migrating the upstream “GNOME classic” (GNOME 2-like experience under GNOME Shell) session to this system, and replace thus the GNOME Shell current override system, in the near future, once the Glib change is merged in (probably in GNOME next cycle). As yesterday, if you are eager to experiment with these changes before they migrate to the artful release pocket, you can head over to our official ubuntu desktop team transitions ppa to get a taste of what’s cooking! Happy testing and playing on those sessions! I hadn’t lied to you yesterday, the vanilla GNOME session and Ubuntu ones are now looking and behaving drastically different! Tomorrow, I’ll show how we implement back some desired behavior changes while still impacting only the ubuntu session, leaving the upstream behavior in the GNOME vanilla session.